Have you found yourself wilting in midlife, and wondering what you might do to flourish in your remaining years? Have you lost your way in the midlife maze due to a significant loss? Did you lose your job or desired career advancement? Did you separate or divorce? Did your last child leave home? Did your family experience a virtual storm of bankruptcy or lose your life savings in a financial meltdown? Did you or someone in your family experience the loss of good health? Or did you weather the death of a family member, partner, or friend? Your loss story is personal. Your path through winding passages during midlife is unique. Perhaps the most important encouragement for your grieving process is to know this simple fact: grieving is a natural healing response to loss rather than a pathological experience. Janis Clark Johnston, EdD, has been a school psychologist in public schools, supervising psychologist at a mental health center, employee assistance therapist, and private practice family psychologist. In addition to providing therapy for children, adolescents, and adults, Johnston has led many staff development workshops for schools and industry on parenting/child development, assertiveness, discipline, problem solving, sexual abuse prevention, behavior disorder interventions, stress management, and grieving. A frequent presenter at national psychology and educational conferences, Johnston has published 13 journal articles, 3 book chapters, and a parenting book, It Takes a Child to Raise a Parent: Stories of Evolving Child and Parent Development (2013, Rowman & Littlefield). In 2002, Sarah’s Inn, a domestic violence shelter and education center in Oak Park, Illinois, honored Johnston with a Community Spirit Award for her support of women and child victims of domestic violence. An active supporter and consultant for Parenthesis, a not-for-profit parenting education center for teen, single, adoptive, preemie, post-partum, and mainstream parent groups, Johnston is a frequent presenter of parenting workshops. She received the 2011 Founder’s Award in appreciation for her dedication to the mission of Parenthesis Family Center. She has served on the boards of DePaul University Family Law Center (Chicago), Parenthesis, and Oak Park Education Foundation, a community group augmenting public schools with creative programming. Part III: Before “Kicking the Bucket,” Grab Your Bucket List and Enjoy! 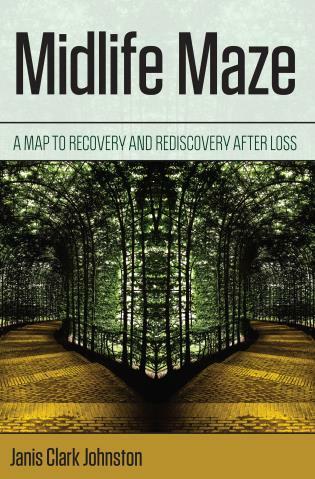 Exceptionally well written, impressively informative, exceptionally well organized and presented, "Midlife Maze: A Map to Recovery and Rediscovery after Loss" is as thoughtful and thought-provoking as it is inspired and inspiring. Thoroughly accessible for the non-specialist general reader, and having extraordinary value for academia as well, "Midlife Maze" is unreservedly recommended for both community and academic library collections. Janis Clark Johnston’s professional life as a psychologist and therapist as well as her personal experiences of loss have prepared her well to guide the reader through the depths, challenges, and ultimate opportunities that accompany loss in midlife. Combining scholarship with practical advice at every turn (a key inspiring concept), Johnston offers the reader a needed helping hand through life’s inescapable losses. In Midlife Maze, Dr. Johnston identifies the inevitable losses which accumulate in the course of our lives, and reframes this potential victimage as a challenge to replenishment, renewal, and redefinition. Moving from a recipient position to one who constructs a new life, and develops new resources, recovers one’s autonomy in the presence of loss. Midlife can be a time of reflection, rebellion, or reconnecting to old or new interests and activities. It can also be a time when losses start to happen or begin to pile up – divorce, death of a loved one, loss of a job or home, the moving out and on of grown children—and learning how to move forward can be a challenge. Here, a seasoned psychologist looks at the geography of loss in midlife, the way it can affect us, and what we can do to get back on track or redirect ourselves when necessary. Through first hand stories and practical exercises, the author leads readers through the midlife maze to a place of recovery, purpose, and peace.